Courtney Carey demonstrates his flavor pairing skills as he uses cranberries in his cake, and pairs it with candied pecans. The classically trained opera singer hopes the judges will like his Cranberry and Cherry Bundt Cake recipe. In the first signature bake challenge of season two episode 1 of The Great American Baking Show, He makes his bundt cake's presentation pop with a tip from his grandmother, a cream cheese glaze with candied pecans. Watch the full episode of "Cake Week" to see if the judges were impressed with his first bake. Preheat oven 350⁰ F - 176 ⁰C. 1. Grease (with vegetable shortening) and flour a 10 cup Kugelphopf Bundt pan and set aside. 2. Place a sifter over a large mixing bowl. Add flour, baking powder, and kosher salt to the sifter. Sift those ingredients over the bowl and set aside. 3. In the bowl of a stand mixer fitted with a paddle attachment cream softened butter and sugar for 8 minutes on medium-low speed. The mixture should turn pale yellow, and increase in volume. 4. Reduce the speed of the mixer to low and add the eggs to the butter and sugar mixture (add eggs 1 at a time). 5. Add vanilla extract to the batter after all of the eggs have been incorporated. 6. With the mixer still on low speed add ¼ of the flour mixture to the batter inside >the stand mixture. 7. Add ¼ cup of sour cream- alternate this process - flour/sour cream until it has all been incorporated. Start and end with flour. 8. Turn off mixer and stir the batter with a wooden spoon, scraping the sides and bottom of bowl. 1. Before mixing the cake batter, add cranberries and cherries to a medium mixing bowl. Bring two cups of water to a boil in a medium saucepot. 2. Cover the berries, sugar, cinnamon with 2 cups boiling hot water. Set aside for 5 minutes. Reserve ½ cup of the water for later. 3. After 5 minutes add cherry liqueur. 4. Transfer mixture to a food processor fitted with a steel blade. Puree mixture until no large chunks or pieces are visible. If needed add reserved water to loosen the mixture slightly. 5. Set aside until cake batter has been prepared. 6. Layer filling into cake batter, alternating between batter and filling. Be sure to swirl the cranberries at each layer. DO NOT allow the filling to touch the sides of the pan! NOTE: The filling will be thick. Do not worry, this is fine. 1. Add the cream cheese, butter, and vanilla to the bowl of a stand mixer fitter with a paddle attachment. Mix until incorporated and smooth. 2. Add confectioners sugar slowly. NOTE: To avoid lumps in the frosting, sift the sugar before adding to the mixer. 6. Place pecans on sheet tray lined with baking mat in a flat layer. Allow to cool. 3. Place icing into a piping bag fitted with a large round tip. 4. Pipe icing into the grooves of the Kugelhopf leaving the large portions of cake exposed. Smooth icing with a small offset spatula or the back of a spoon. 5. 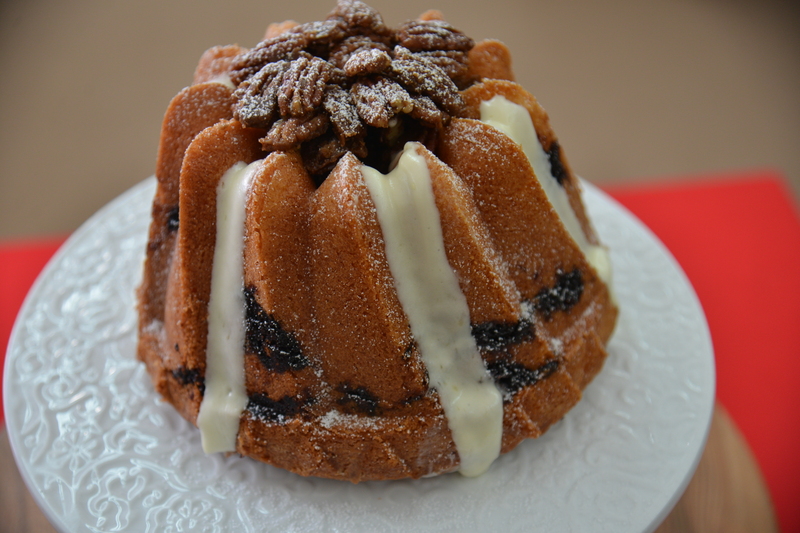 Fill center of Kugelhopf with sugar coated pecans White cake stand – from the tent.